Who would vote for the guy who fired your dad and the man who denied him unemployment? Mitt Romney has had a lot of problems gaining momentum with his campaign for the presidency since he became the presumptive nominee. Romney has been dogged about his experience heading a private equity company, Bain Capital, and not releasing more than one year's tax returns (Romney has yet to release his latest return). The attacks on Romney has taken a toll - his favorability ratings have shifted giving the president a several point advantage. Romney has tried to change the subject several times but each attempt has been met with even more disappointment for Romney. For instance, Romney wanted to stop people from talking about his financial situation and the possibility that he paid zero taxes by going on a multi-country tour to try and show people that he could look and act presidential. Romney unfortunately had a bout of foot-in-mouth disease insulting not one but three countries. First he insulted Great Britain by speculating their readiness for the Olympics, causing him to be mocked on both sides of the ocean. Then Romney traveled to Israel where he got the Israeli capital wrong and insisted Palestinian culture is the cause for all their hardships, and finally, Romney's aide disgraced the Polish Tomb of the Unknown Soldier when he claimed the press were disrespecting the tomb using some profanity against the reporters to emphasize how much they were being disrespectful. Upon returning from overseas Romney saw no bump and had the conversation shift back to Bain and his taxes. While Romney may have won a battle in the Bain wars with the release of a pro-Obama video that seemed to imply Romney was the cause of a woman's death because he shut down a factory, Romney quickly lost any gains by crying to the media that Obama should promise to leave his business record alone (despite Romney using his business experience as one of the main reasons we should elect him) and getting into a fight with Senate Majority Leader Harry Reid. Reid cited a conversation with an anonymous Bain source in saying that Romney had not paid any taxes for years. This attack isn't anything new - there have been other articles out there that speculated the same exact thing - but Romney and his surrogates felt upset that this attack was coming from a top Democrat and decided to step up to the accusations but the pro-Romney forces stumbled. Romney failed to initially out-right deny the claims and instead used the "I paid what I legally had to" line, and then he and his friends promised the American public that they should take his word that he paid his taxes. That didn't work so what was Romney's last card in his hand? Play the vice-presidential nominee pick and change the subject. Romney decided to do it - two weeks before the Republican National Convention. Will Romney's announcement change the subject away from his taxes and give him a fighting chance again? While Ryan may be popular among conservatives for trying to gut the government and bring forth a Rand-ian paradise, he is relatively unknown throughout America and does little to excite those outside the Republican base. Ryan in constantly being called a policy "wonk" despite failing to come up with anything of value. His signature budget plan, which Romney instantly distanced himself from despite praising it prior to the pick, is hardly "wonk" material - it has been deemed by numerous organizations (bot partisan and non-partisan) to be disastrous. 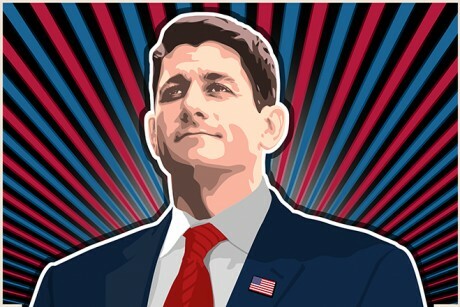 Ryan has also accomplished very little in his 13 years in Congress, and if the bills that he had passed are any indication of how a Romney-Ryan ticket would govern, you could forget any kind of advocate for the middle class being in the White House. For instance, one bill Ryan passed altered the taxes on arrows. Ryan is an avid archer and authoring such legislation would directly benefit him. Sure we are talking about arrows but who would even think of changing the excise taxes on arrows to begin with? This, of course, leads us back to taxes. Ryan's budget plan not only strips the government of virtually everything of importance, but it also drops taxes - especially for the wealthy. Romney's taxes under the Ryan plan would be reduced to one percent. To be technical (wonkish? ), Romney's tax rate would be .82 percent. It might seem impossible to fund the government when the super-rich pay no taxes. That is accurate. Ryan would actually raise taxes on the bottom 30 percent of earners, according to the nonpartisan Tax Policy Center , but that hardly fills the revenue hole he would create. The solution? All but eliminate all government outside of Social Security and defense -- a point my colleague Derek Thompson has made in incredible chart form. Ryan's selection also did not completely erase the question of Romney's taxes. On CBS' 60 Minutes, Ryan offered a uniformed front telling Bob Schiefer that the public will only see two years of his tax returns (Will he actually release them though?) and that while he is going to show everybody two years, he showed Mitt Romney more, which brings us to another question - why is it that with Romney, what is good for the goose is not good for the gander? What is so damaging about letting everyone see your tax returns? Especially when you are campaigning as a champion of the middle class and insisting that you know best? Because of Ryan's response, I am sure that the tax question won't go away. Besides, who would want to vote for the guy who fired your dad and the man who denied him unemployment benefits? I have two things to say about Paul Ryan. One: He wears his suits poorly. Two: He looks like Gabe from The Office!